BugDoc Dave here again for Stretch Tuesday. Tonight, I’m going to start a discussion on decorated stretch glass. This is another major difference between carnival glass and stretch glass. While there are some decorated carnival glass pieces, especially among some of the simpler pitcher and tumbler sets, additional “jazz” on a carnival piece can actually detract from the patterns already in the glass. There are numerous types of decoration that were applied to stretch glass. The most common ones are cuttings, acid etching, glue-chip etching, and enamel decorations. We also see pieces with applied metal rings and/or bases, decals, and applications of sterling silver. Tonight, I’ll cover the decorations where glass is removed – cutting and etching. Cutting removes glass using a cutting wheel. 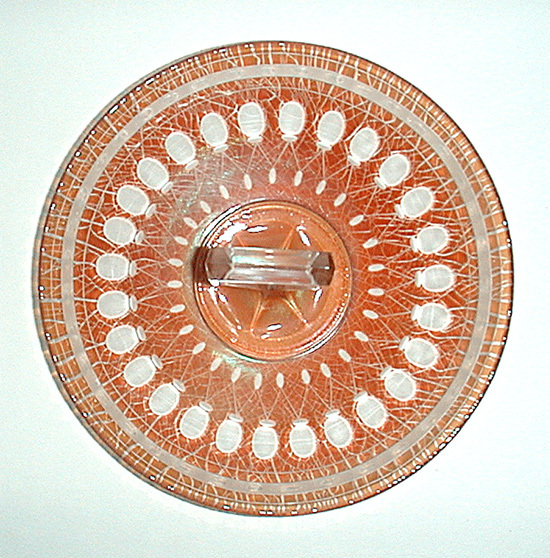 This is generally a single blade or a gang of blades that are used with diamond powder to cut a design into the glass. 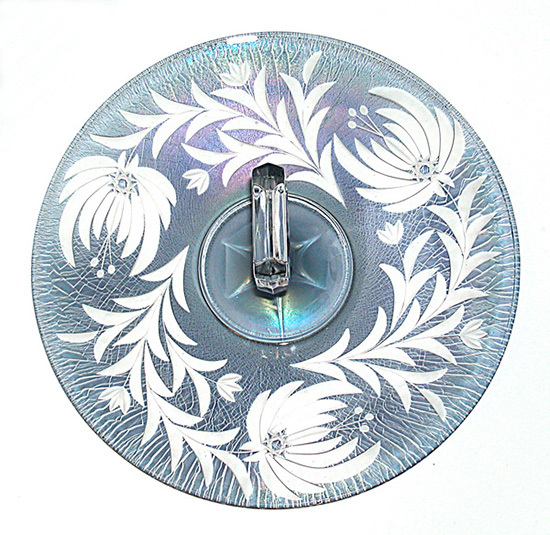 In cut crystal, these designs are then polished, but in stretch glass cuttings, the designs were rarely polished, so the designs will appear to have a satin finish. The problem with cuttings on stretch glass is that several of the manufacturers did cuttings in their own decorating shop or they may have sold the “blanks” to another decorating company who then did the cuttings in their shop. It’s obvious that Imperial did most of the cuttings on their glass in their shop, but we have seen a couple of cuttings on Fenton’s pieces that were likely done by another shop. Some of the more elaborate cuttings were done by Imperial. They cut no less than eight geometric and floral designs on their handled servers. There are no set names for these designs, and we haven’t been able to locate catalog illustrations that include images of the known designs. I’m including a geometric design commonly called balloons, and another one called chrysanthemum. 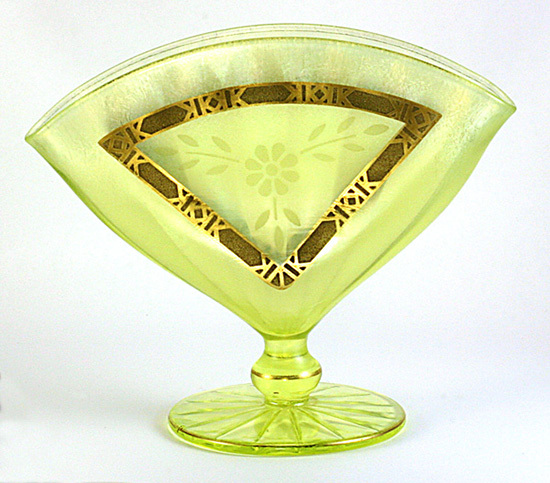 Fenton also did some cutting on their stretch glass, primarily their Grecian Gold pieces, but occasionally on candy jars, pitchers and tumblers. 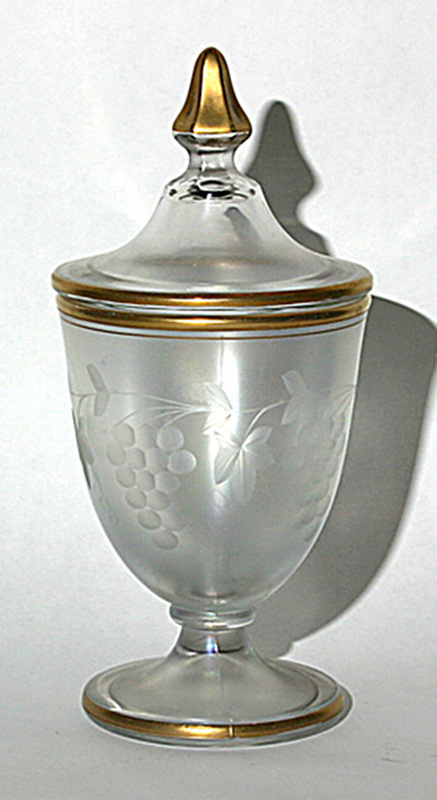 The most common one on candy jars is a grape cluster with vines. The ones on pitchers and tumblers are usually floral designs. 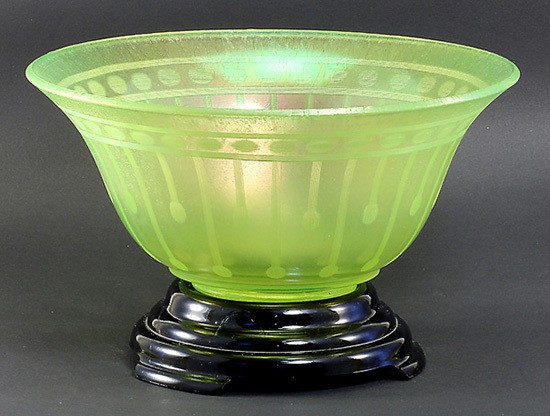 A design seen on both Fenton and Northwood pieces is often called “match stick.” This was done with a gang wheel. It consists of straight lines that end in a larger oval or circle. Occasionally, there will be a band of circles on the piece too. If you look closely at the cuttings, you’ll see that there are five to ten thin lines which is the number of wheels that were ganged together to do the cuttings. Acid etching is a process where a wax design is heat attached to the glass. 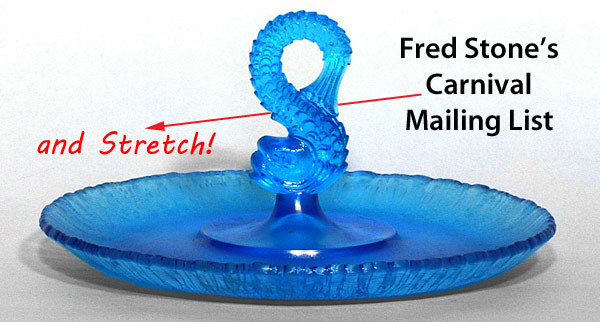 This wax design has places where the glass is not covered. When this glass is either “vapored” in a booth with hydrofluoric acid or a solution of the acid is painted over the wax, the glass is etched (dissolved) away. After a period of time, the glass is washed off and the wax is removed. The design is thus, etched into the glass. Most of the etched area was then painted with gold paint to further enhance the visibility of the design. It appears that little acid etching of designs (usually a band around the edge of a piece) was done by the manufacturers. Most of the designs appear to have been made by the Wheeling Decorating Company and a few are known to have come from the Lotus Company. This is when things can get a bit confusing for collectors as there are Northwood and Fenton pieces with identical acid etched designs. In short, you can’t identify a glass maker by these etched designs! Fenton obviously did some of their own acid etching as the forward and backward “K” design is fairly common on cigarette boxes and fan vases. Finally, there is “glue chip” decoration. There are conflicting stories as to what this was actually called. Some say that a special fish glue was used and others state a hide glue was used. In any case, a glue is applied to the glass, usually as a band, but can also be overall or in geometric shapes. The glass is then put into an oven and when the glue shrinks as it is heated, it pulls away thin slivers of glass. When done, the glass has the random look of wintertime frost on a window. 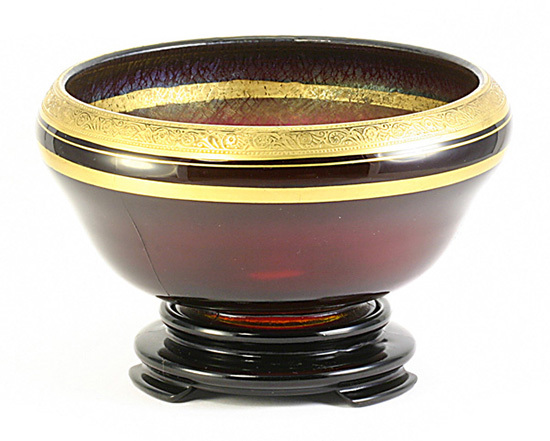 Again, the area receiving the treatment was usually painted with gold enamel to enhance the look. So, for those of you needing more pattern on your glass, take a look at cut or etched stretch glass, but expect to pay a premium for such pieces!